For other places with the same name, see Shangri-La (disambiguation). 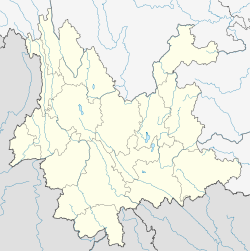 Shangri-La was formerly called Zhongdian County (中甸县; Zhōngdiàn Xiàn) but was renamed on 17 December 2001 and upgraded into a county-level city on 16 December 2014 as Shangri-La (other spellings: Semkyi'nyida, Xianggelila, or Xamgyi'nyilha) after the fictional land of Shangri-La in the 1933 James Hilton novel Lost Horizon, in an effort to promote tourism in the area. Formerly, the Tibetan population referred to the city by its traditional name Gyalthang or Gyaitang (Standard Tibetan: རྒྱལ་ཐང།; Wylie: rgyal thang, ZWPY: Gyaitang), meaning "Royal plains". 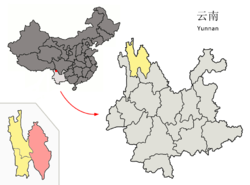 This ancient name is reflected in the Tibetan Pinyin name within the town of Jiantang (建塘; Jiàntáng), the city seat. In the early morning of January 11, 2014, a fire broke out in the 1,000-year-old Dukezong Tibetan neighborhood. About 242 homes and shops were destroyed and 2,600 residents were displaced. About half of the old town was destroyed by the fire, half was spared. After the fire residents were allowed back to their homes and shops. By the end of 2014 rebuilding had started and tourism started to come back. Generally tourism was not affected by the fire, since the main sights in the old town, such as the prayer wheel and temples were not damaged. Many of the other main sights are located outside of the old town. Shangri-La has a monsoon-influenced humid continental climate (Köppen: Dwb), due to the high elevation. Winters are chilly but sunny, with a January 24-hour average temperature of −2.3 °C (27.9 °F), while summers are cool, with a July 24-hour average temperature of 13.9 °C (57.0 °F), and feature frequent rain; more than 70% of the annual precipitation is delivered from June to September. The annual mean is 6.32 °C (43.4 °F). Except during the summer, nights are usually sharply cooler than the days. Despite the dryness of the winter, the small amount of precipitation is generally sufficient to cause major transportation dislocations and isolate the area between November and March. Being located just 27° in latitude from the equator, the effects of altitude on the climate are so exceptional that it actually means the average yearly temperature is 2 °C (3.6 °F) lower than that for Bergen, Norway, located as much as 60° from the equator. Pudacuo National Park, the first national park in China to meet IUCN standards, is part of the Three Parallel Rivers of Yunnan Protected Areas World Heritage Site. The town's airport is Diqing Shangri-La Airport. Covering an area of 225 hectares, it is one of the biggest airports in the northwest of Yunnan. There are flights to Kunming, Chengdu, Lhasa, Guangzhou and Shenzhen. Since there is no railway available in Shangri-la, taking a long-distance bus is also a major means to get to Shangri-la besides flight. It takes about 4 hours to get to Shangri-la from Lijiang by bus. Tourists who rent a car for the trip can also visit the Tiger Leaping Gorge and the First Bend of Yangtze River on the way. Many travelers use the county town as a gateway into Tibet, either travelling many days overland by jeep to Lhasa, or by flying from the city's airport. However, the town itself is a tourist destination, primarily due to the nearby Gandan Sumtseling Monastery, Ganden Sumtsen Ling, 松赞林寺 Sōngzànlín Sì), Pudacuo National Park, and Tiger Leaping Gorge. ^ "Shangri-La (Xiānggélǐlā 香格里拉), chef-lieu de la préfecture autonome tibétaine de Diqing, Yunnan (Yúnnán 云南)". channaryetfrancoisashanghai.net (in French). Retrieved 10 August 2015. ^ "Night fire burns for hours, destroys ancient Tibetan town in southwest China's Shangri-La county". Toledo Blade. January 11, 2014. Holas, Ashild. "Tourism and Tibetan Culture in Transition: A Place Called Shangrila" (Routledge Contemporary China Series). Routledge, September 12, 2007. ISBN 8173871094, 9788173871092. Wikivoyage has a travel guide for Shangrila. Wikimedia Commons has media related to Xamgyi'nyilha County. This page was last edited on 8 March 2019, at 15:54 (UTC).